The crew of the U.S.S. Kearsarge spell out the words "Mercury 9" on the deck in 1963. In this historical photo from the U.S. space agency, the crew of the U.S.S. 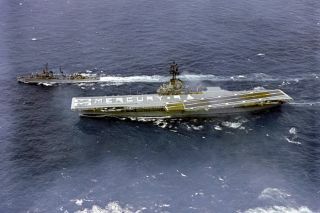 Kearsarge spell out the words "Mercury 9" on the ship's flight deck while on the way to the recovery area where astronaut Gordon Cooper is expected to splash down in his "Faith 7" Mercury space capsule.